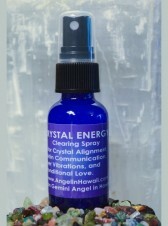 These aromatherapy clearing sprays bring in energy all around you, and in your space. It clears your etheric body, chakras, space, and also calls in the specific energy. 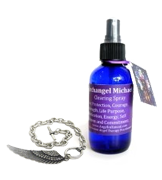 All products are invoked with Romance Angels, Archangels, Masters, Gods and Goddess Energy, Moon Energy, and are Reiki Attuned. 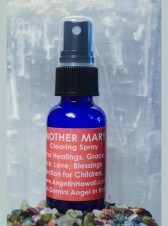 Blended with pure botanical essential oils, blessed and purified water. Spray over, above & around yourself. 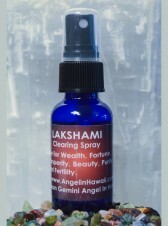 Spray in corners of home, or space, or anywhere you want to bring specific energy in. Angel of Passion will help bring in a gift of spirit. Passion is most known when the mind, body and spirit work together to create, develop and manifest our feelings, ideas and most sacred values. 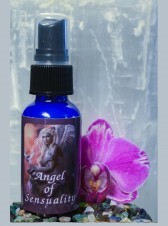 Angel of Twin flame helps you find your twin flame and feel a strong sense that you will be together for all eternity. This is a very sacred sense of intimacy and feeling of divinely inspired wholeness that one finds within a twin soul relationship. Angel of Intimacy helps you being able to let your guard down, and Intimacy is also about being able to accept and share your feelings. To be able to share your ‘inner-world’ with the world and who you love. Angel of Sensuality helps you become aroused by things of beauty, to be aware of the world, life and love with all the senses. Being sensual in life through our senses, and feelings connects us to the world of spirit. 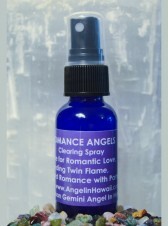 Use Romance Angel products to help find you twin flame. Helps to increase romantic love with you partner. Enhances beauty in life. Proprietary blend of essential oils, cedarwood, frankincense, ylang ylang, mandarin, blessed water. 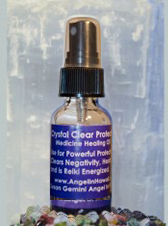 Use for Powerful Protection, Clearing Negativity, and is Reiki Energized. Blessed water, Sea salt, and stones. *No essential oils. 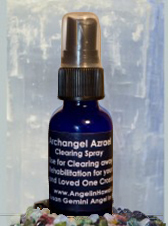 Use Archangel Azrael for Clearing Away Grief, Rehabilitation for your heart and for loved ones crossing over. Lavender 40/42, Pink Grapefruit, Cedarwood, Cistus, Ginger Root, Tea Tree, and blessed water. 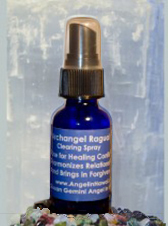 Use Archangel Ragual for Healing Conflicts, Harmonizing Relationships and Bringing in Forgiveness. Use Jeremiel for letting go of the past and allowing new changes. Also use to bring in new life of Harmony. Proprietary blend of pure essential oils, Peppermint, Eucalyptus, Rosemary, Sweet Basil, Spearmint, Lavender, Ginger Fresh, Ravensara, Cinnamon Leaf, Lemongrass, Helichrysum, Roman Chamomile, and blessed water. 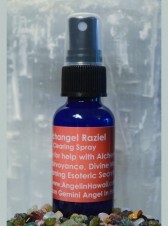 Use Raziel for alchemy, clairvoyance, divine magic, esoteric information and manifesting. Proprietary blend of pure essential oils, bergamot, cypress, lavender 40/42, juniper, tea tree, pink grapefruit, patchouli, lemon, blessed water. 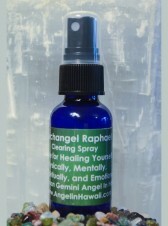 Use Raphael to heal. He is heaven’s doctor. Also for a healthy lifestyle and travel protection. Proprietary blend of pure essential oils, bergamot, cinnamon, grapefruit, lemon, lime, mandarin, orange, patchouli, peppermint, rosewood, tangerine, ylang ylang, blessed water. Use Ariel for healing and protecting Mother Mary and animals. Also use for environmental actions. Proprietary blend of pure essential oils, Ylang Ylang, Lavender, Lemon, Mandarin, Palmarose, Rosewood, Rose, and blessed water. Use Zadkiel for enhancing memory, compassion, forgiveness, surrendering and harmony. Proprietary blend of Pure Essential Oils, Lavender Lemon, Mandarin, Rosewood, Orange, Blessed Water. Use Michael for protection, courage, motivation, energy, and to push you into your life purpose. 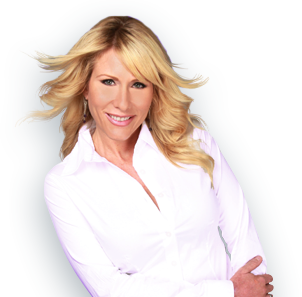 Use Chamuel to help find a soulmate, true love, your life’s purpose, and career. 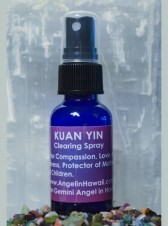 Proprietary blend of pure essential oils, yiang yiang, lavender, lemon, mandarin, palmarosa, rosewood, blessed water. Use Gabriel to help with fertility and conceiving a child as well as parenting. 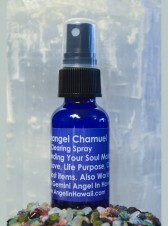 Proprietary blend of pure essential oils, Roman chamomile, German chamomile, lavender, mandarin, tangerine, blessed water. 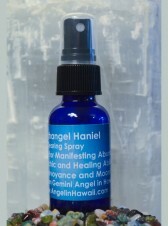 Use Haniel to help with manifesting abundance, enhance psychic and healing abilities and grace. 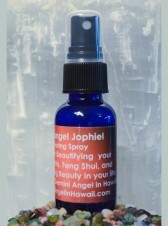 Use Jophiel to help bring beauty into your life. Also for feng shui, interior design, and beautifying thoughts. Use Metatron to help clear chakras, aura and body, may assist with children’s issues, and ADD, ADHD. Use Uriel for divine magic in your life, spiritual understanding, alchemy and studies. Proprietary blend of pure essential oils, bergamot, blessed water. Use fairies for manifesting love, and money. 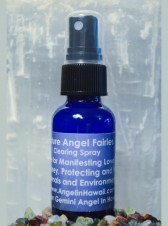 Helps protect children, animals, and the environment. Also for working with elementals to increasing playfulness and joy. Proprietary blend of pure essential oils, pink grapefruit, lemon, lime, litsea, mandarin, sweet orange, blessed water. 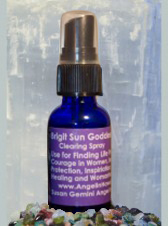 Use Brigit, the Sun Goddess, for finding life purpose, courage in women, insight, protection, inspiration, healing and womanhood. Cedarwood, Juniper Berry, Frankincense and blessed water. Use Crystal Energy for crystal alignment, dolphin communication, higher vibrations, and unconditional love. Proprietary blend of pure essential oils, rose, lavender, and blessed water. 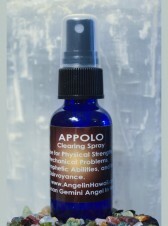 Use Apollo for physical strength, mechanical problems, prophetic abilities and clairvoyance. Proprietary blend of pure essential oils, patchouli, olibanum, pimento, citronella, and blessed water. 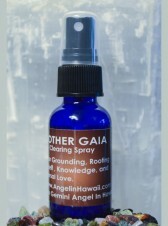 Use Mother Gaia for grounding, rooting yourself, knowledge and universal love. Proprietary blend of of pure essential oils, ginger, lavender, blessed water. 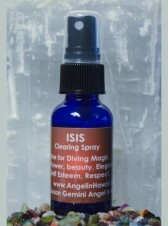 Use Isis (Feminine Goddess) products for divine magic, power, beauty, elegance, self esteem, and respect. Proprietary blend of pure essential oils, myrrh, ylang ylang, rose, witch hazel, blessed water. Use Kuan Yin for compassion, love and kindness. Kuan Yin is the protector of mothers and children. Proprietary blend of pure essential oils, Rose Geranium, and blessed water. Use Lakshmi to bring in wealth, fortune, prosperity, beauty, purity and fertility. 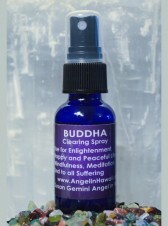 Proprietary blend of pure essential oils, ylang ylang II, geranium, lavender, lemon and blessed water. 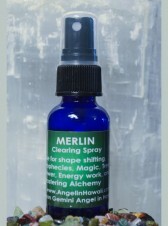 Use Merlin for shape shifting, prophecies, magic, tree power, energy work, mastering alchemy. Proprietary blend of pure essential oils, fir, neddle, blessed water. Use Mother Mary for healing, grace, peace. Love, faith, blessings and protection for children. Proprietary blend of pure essential oils, rose, blessed water. Use Pele products to find truth in your life. 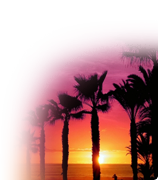 Passion awakening your inner flame and empowerment. Proprietary blend of pure essential oils, cinnamon, anise, ginger, lemon, helichrysum, basil, blessed water. Use Sedna for ocean conversations, ocean protection, messages from dolphins and whales, and granting wishes. Proprietary blend of pure essential oils, lavender, blessed water. Use Shakti for destroying demonic forces, restore balance, vitality and Kundalini Energy. Proprietary blend of pure essential oils, Citrus limonum, Rosemary, Peppermint, Eucalyptus, Spearmint and blessed water. 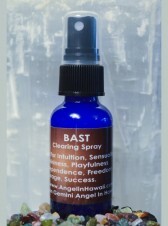 Use Bast to bring in intuition, sensuality, feminineness, playfulness, independence, freedom, courage and success. Proprietary blend of pure Essential Oils, ylang ylang, and blessed water. Use Ganesh to remove obstacles, to see beyond illusion and to have success. Proprietary blend of pure essential oils, lavender, rosemary, ylang ylang, orange lemon and lime, blessed water. Use Buddha for enlightenment, to achieve a happy and peaceful life, mindfulness, meditation, and to end all suffering. Proprietary blend of pure essential oils, patchouli, olibanum, pimento, citronella, blessed water. 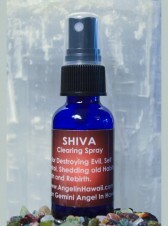 Use Shiva for destroying evil, gaining self-control, shedding old habits, death and rebirth. Proprietary blend of pure essential oils, peppermint, spearmint, eucalyptus, wintergreen, orange, grapefruit, blessed water. 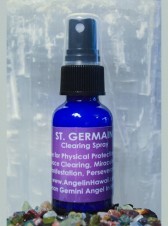 Use St. Germain products for psychic protection, space clearing, miraculous manifestations and perseverance. Proprietary blend of pure essential oils, frankincense, blessed water.